A recent study of the Olentangy River and two tributaries in Delaware County finds the river mainstem meeting biological criteria for fish communities, but the two tributaries falling short. The study, conducted by Mark Dilley of MAD Scientist Associates in October 2016, reports that the stream health measures for the mainstem have remained stable relative to sampling conducted in 2003 by Ohio EPA at locations upstream and downstream of the study site. The consistent fish community scores for the mainstem site may be the result of positive water quality and habitat improvements off-setting potentially adverse effects of increasing rates of development in this region of Delaware County, according to Dilley. The positive water quality improvements Dilley identifies include the recent removal of two low-head dams in the area, riparian setbacks that were put into effect, and improved sediment and erosion control practices at construction sites. Dilley, a professional wetland scientist and certified senior ecologist, worked with Laura Fay and Marci Bird of Friends of the Lower Olentangy Watershed (FLOW) to develop the study plan. The sampling was conducted in early October by Dilley, Aaron Laver and Jacob Zink of MAD Scientist Associates, and Joe Bevan a FLOW volunteer. 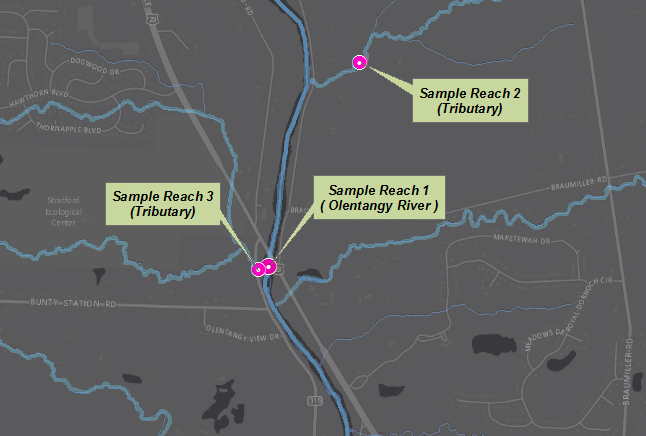 Dilley has provided FLOW with the results and findings to help FLOW track water quality trends in the Olentangy River and its tributaries, and to better manage and protect these areas. The study’s objective was to evaluate the current health of stream habitat within segments of the Olentangy River tributaries and mainstem. Stream health was determined by surveying the fish community using Ohio EPA sampling methodologies, and scoring the results using Ohio EPA’s Index of Biotic Integrity (IBI) and Modified Index of Well-Being (MIwb; wading sites only). The condition of the stream and riparian habitat at the sampling sites was surveyed using the metrics of the Qualitative Habitat Evaluation Index (QHEI). The use by Dilley of the same sampling and evaluation methods used by Ohio EPA, allows for direct comparison with past sampling and future stream studies conducted by Ohio EPA. Tables 2 and 3 in the report compare Dilley’s results with Ohio EPA’s 2003 results for nearby mainstem sites, as well as a comparison with other tributaries. We at FLOW appreciate that this study gives us a much needed glimpse at the current conditions in the watershed. An IBI score of 40 is needed to meet biological criteria for a wading stream, that is designated warm water habitat. This table was excerpted from Table 2, 2016 Olentangy River & Tributaries Fish & Habitat Surveys, Dilley.